All oils are not created equal when it comes to cooking. We lay out which ones are best for your salad dressings and non-heated dishes, and which ones are A-OK for cooking with. Not sure if you’re cooking with the right, or healthiest, oil? When you’re cooking (as in heating) an oil, there are definitely some good choices and bad choices. Here, we break it down for you. You should opt for a cooking oil for cooking — which by definition is made from a plant source and it typically a liquid at room temperature. 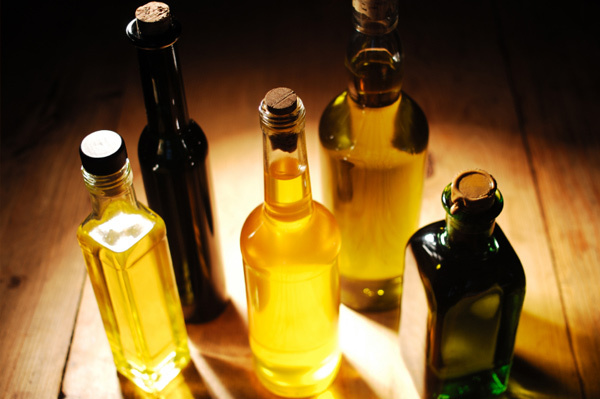 These oils are unsaturated, containing mostly monounsaturated and polyunsaturated fats. Butter (which is mostly saturated fat and, as you know, is not liquid at room temperature) is off limits if you’re looking for the healthiest oil to cook with. Olive oil is indeed good for you (it is, after all, a key component of the Mediterranean diet, which is often touted as the healthiest diet in the world), thanks to its monounsaturated fat and phytochemicals. But it’s not the best for prolonged, hot cooking. While it has been shown to give a boost to your good cholesterol while lowering your bad cholesterol, olive oil is better off as part of your salad dressing or to dip your bread in. This is because olive oil (both the extra virgin and virgin varieties) has a low smoking point — it easily starts to break down and begin to burn when heated. When it comes to cooking, these three oils are also a bad choice, again due to their low smoking point. Heating these oils will actually kill off the healthy properties of the essential fatty acids they contain. You’re best off using these oils in your salad dressing. Or, you can also try them when whipping up a marinade for your veggies or meats. There are actually many healthy choices for cooking with oil, and chances are you are probably already using one or two of them. Thanks to their high smoking point, canola, corn, safflower, sunflower, grapeseed and peanut oils are the ones you should reach for when you’re at your stovetop.